Residents keen to ‘make a difference’ took to the local lanes on a litter picking mission. 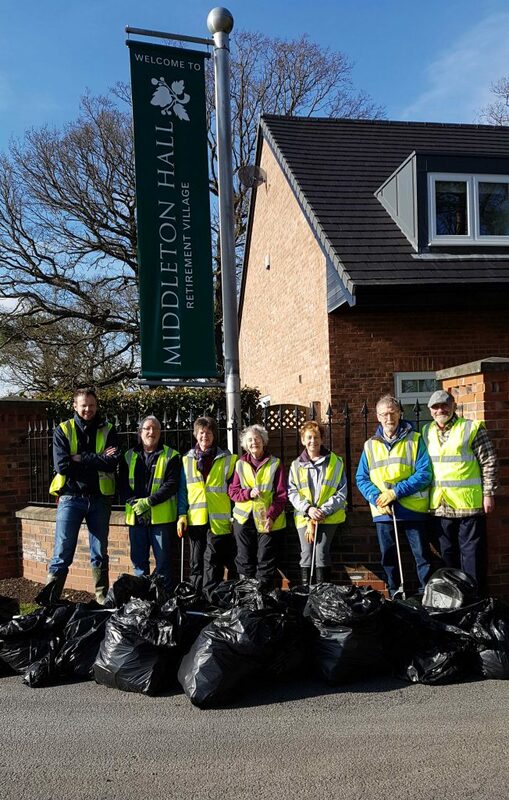 Tired of rubbish being carelessly discarded in the otherwise beautiful Middleton St George location, they got together and enlisted the support of the Sustainability Team at the retirement village. As they set off with practical and protective kit, it was clear that there was work to be done. Even they were shocked at the volume and range of litter collected in just a 300m distance. In addition, they found other weird and not-so-wonderful items such as a car tyre, an 8ft length of plastic piping, 2 x 25 litre plastic drums and a metal sign. MD Jeremy Walford joined the team to lend a hand. He is a strong advocate of Sustainability – one of the 5 core organisational values. The litter picking was one of a range of moves to reduce impact on the environment in the local and wider community. Councillor Doris Jones is another supporter and on hearing about the initiative arranged for the council to collect the bags for disposal. All in all, it was a very productive, even enjoyable afternoon. This entry was posted in News on March 22, 2018 by Jan.